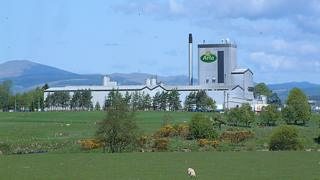 Dairy giant Arla has set out its concerns to Scotland's migration minister about the potential for disruption caused by Brexit. Ben Macpherson visited its creamery in Lockerbie as well as a dairy farm near Dumfries. He spoke to some of the hundreds of EU nationals the company employs at its sites across the UK. Arla said it had consistently expressed concern about Brexit's possible impact on the firm and its supply chain. Speaking ahead of his visit Mr Macpherson said EU nationals living and working in Scotland were "part of the fabric of our nation" and it was "absolutely vital" they felt "welcome and supported to stay". "In communities across Scotland, EU nationals enrich our society and are fundamental to the strength of our economy, both now and in the future," he said. "What's more, without EU nationals making such a significant contribution we would face workforce shortages in the south of Scotland and other areas, and in several sectors like agriculture, education, construction and health and social care services. "We would face workforce shortages in both urban and rural areas." He said the Scottish government was committed to supporting EU nationals through the UK government's settlement scheme. Supporters of the scheme say it is the best way to ensure that EU citizens are able to stay in the UK legally, even once the UK is no longer a member of the EU. The company said it was "delighted" to hold talks with Mr Macpherson about the issue. "Arla Foods has consistently expressed concern about the impact of any disruption associated with Brexit on our farmers, our consumers and our colleagues, and we are very happy to have the opportunity to discuss these issues with the minister during his visit," said a spokesperson. "Across Arla we have around 500 European nationals who are valued members of our team, and EU citizens are also a very important part of the workforce on farms and across our supply chain. "In addition to giving practical advice and support wherever we can we are committed to working with the minister and other stakeholders to ensure we are best-placed to retain the colleagues that we have, and maintain access to a motivated and skilled labour force in future, enabling us to continue to deliver much-loved dairy products to consumers across the UK."